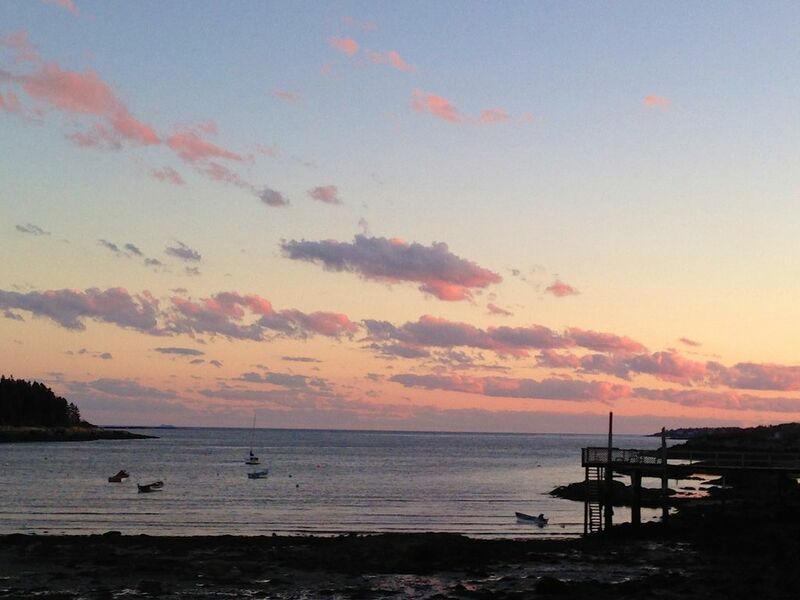 Sheacliff resides on quaint Orr's Island Maine right at the foot of Lowell's Cove and the mouth of the Atlantic Ocean. The rental property is a one room one bath over the garage studio apartment . It has a kitchen, a deluxe queen bed and a queen sofa bed to sleep four comfortably. There are beautiful southerly views of Lowells Cove & the Atlantic Ocean. Let the lapping of the waves lull you to sleep as you dream of your next days adventures in Maine. Imagine waking in the morning to the sound of seagulls cawing, birds chirping and flying about, & butterflies fluttering from garden to garden. Take your cup of coffee and go downstairs to your patio to see it all before your eyes and watch the morning sun's rays dancing on Lowell's Cove. Or perhaps you might feel like refreshing morning walk, or bike ride to Bailey Island for a delicious breakfast at the quaint Giant Stairs restaurant...note to self ''must have The Giant Stairs reuben and amazing onion rings...delish!!'' Or right next store 'B.I.G.S.' (Bailey Island General Store) for some great breakfast sandwiches, pancakes etc., & all your immediate shopping needs. Next stop, Landsend, a tourist favorite gift shop at the end of Bailey's Island, with a cozy beach and plenty of rocks for climbing all while enjoying the beautiful views of nearby islands. Next stop visit the home of world famous L.L Bean in Freeport , home of the original outlet stores, and just a thirty minute scenic ride from your island getaway! Freeport is a beautiful coastal Maine village with over 200 upscale outlets, designer shops, eclectic boutiques, great restaurants, casual cafes, & numerous outdoor adventures. L.L. Bean also offers guided kayak tours for some fun in the sun! Enjoy an authentic Maine experience, just a short drive north from Boston, and only 15 minutes north of Portland. Speaking of fun in the sun how about grabbing the gang for a picnic or BBQ at Reid State Park. Today, thousands of visitors enjoy the park's long, wide sand beaches like Mile and Half Mile, which are rare in Maine. Enjoyed as a recreational resource, the beaches are also essential nesting areas for endangered least terns and piping plovers and resting and feeding areas for other shorebirds. Rarer than beaches along Maine's coast are large sand dunes, like those at Reid. From the top of Griffith Head, a rocky headland overlooking the park,you can view sweeping seascapes and spot the lighthouses on Seguin Island, The Cuckolds, and Hendricks Head. You can also see several islands, including: Damariscove, a thriving fishing community in Colonial times. Your vacation in Maine wouldn't be complete without a visit to Boothbay Harbour. Wherever you go whatever you do, perhaps its just grabbing a good book a glass of lemonade & heading down to the cove to search for sea glass. You needn't go far to immerse yourself in the beauty & pleasures of Maine here at you Orr's island getaway! A hundred yards to the water & the classic rocky shores that Maine is known for. A wonderful peaceful Maine fishing town located near the end of a beautiful peninsula. Vanity w/toilet, storage, linen shelves & Shower. 2-3 minute walk to Lowell's Cove right at the mouth of the Atlantic ocean. Over all we were impressed with this rental. Location of this property was convenient to great seafood, a charming local beach and the amenities of nearby Brunswick and Freeport. The unit was very well equipped and quiet. The drawback was the foul smell of the undrinkable water...strong sulfur dioxide smell. Drinking water was supplied but previous to our stay no mention was made of the status of the water and there was no attempt to alert us to this when we arrived. This cozy place was exactly what we expected. My husband and I were able to enjoy a beautiful, quiet and comfortable spot near the ocean. Our dog loved all the nice local areas to explore/hike with us. Many thanks to Mark who made sure we had everything to make our vacation a success. Nice getaway to relax ! My wife, our pets Eli and India and I stayed at the Sheacliff apartment on Orr's Island during the end of July, beginning of August, 2014. What a delightful, clean, beautifully appointed, comfy and well situated accommodation this is. It's just a few minutes walk to the picturesque Lowell's Cove, where we walked almost every morning, and a point of departure for touring the Maine coast along Orr's and Bailey islands, Harpswell and further afield to Freeport, Bath, Brunswisck and Damariscotta. Our hosts Shirley, Kevin and Mark made us feel at home. Do sound out Mark for his recommendations on where to eat locally on Orr's and Bailey islands, as well as farther afield. All of his recommendations were spot on for value, taste, and service. Two recommendations with particularly gorgeous views are the Dolphin Marina and Restaurant and Estes Lobster House with its lobster specials. And for some of the most inventive and delicious tavern fare we've ever had, drive over to Damariscotta and King Eider's Pub. We highly recommend Sheacliff and would happily pay a return visit whenever we stay on the mid Maine coast. This place is close enough to major attractions and far enough from the hustle to be perfect for a relaxing trip. Lobsters available right down the street to cook in your own nice little kitchen. We'll kept and clean. Owners are very courteous and anxious to help you enjoy your vacation. A few hundred feet walk to the water. Portland is almost an hour drive. Reid's state park is almost an hour and has an incredible beach. Five islands lobster co is right by Reid park and was great. I can recommend pretty much all of the restaraunts within 20 miles, except cooks... We also did a guided, evening sea kayak with h2outfitters which was great. Robert & Marissa we're so happy that you enjoyed yourselves here at our getaway! It was wonderful meeting you both & hope that you will be back to spend your future anniversary's with us as well. We appreciate your kind words as we strive to help our guest have the best possible time & the most comfortable accommodations. Thank you again for choosing us as your Maine island getaway we hope you choose us again in the future! All properties are supplied with pillows and blankets or comforters, they do not come with sheets and towels. You have the option to either bring your own or rent our linen service. This service provides bed sheets, towel sets for the maximum number of guests allowed, bath mats and kitchen towels. Towel sets consist of a bath towel, hand towel and face cloth, you have the option rent more towel sets if needed. The linens are professionally cleaned and sanitized between use.